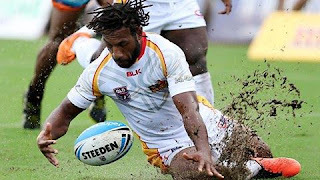 "Electrifying SP Hunters centre Adex Wera has been rubbed out for one match by the QRL judiciary. Wera was placed on report for a dangerous throw during last weekend's round 8 match against Burleigh Bears." The judiciary advised Wera through a tele conference hook up late this afternoon that he has been repeating this offence for the past three seasons and needed to correct his tackling technique. He entered an early guilty plea and was suspended for one match. The Hunters team: Hunters: 1. Stargroth Amean 2. Bland Abavu 3. Israel Eliab 4. Willie Minoga 5. Wawa Paul 6. Ase Boas (C) 7. Watson Boas 8. Henry Wan 9. Wartovo Puara Jr 10. Stanton Albert 11. Nixon Put 12. David Loko 13. Wellington Albert; Reserves: 14. Radley Brawa 15. Enoch Maki 16. Moses Meninga 17. Ishmael Balkawa 18. Butler Morris.